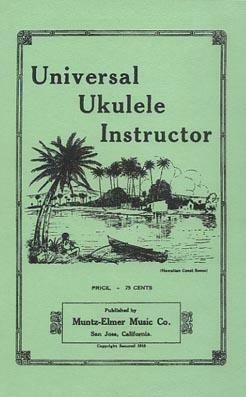 A San Jose, California, music publisher offers a Uke instruction book. Sears Roebuck & Co. is eager to meet the demands of the marketplace following the 1915 Pan-American Expo. They purchase the only instrument manufacturer tooled up to produce ukes, the Harmony company, and began pushing ukes and Hawaiian guitars in their catalogues beginning in 1917. The Martin Guitar Company had been established in the United States in 1833 by Christian Friedrich Martin, a German immigrant who had been shop foreman for Johann Stauffer, the renowned guitar maker in Vienna. From 1833 until 1916, Martin excelled as the preeminent maker of small, parlor-sized, gut-strung guitars. Martin built its first Ukes in 1907, without sales success. They tried again in 1915, riding the crest of the wave of the Pan Pacific Exposition and modeling their Ukes after the proven, successful Nunes instruments. These Ukes were all Mahogany, with corresponding Koa models appearing in 1920. A tremendous number of ukuleles were sold in the fifteen years of the initial fad, and increasing demand prompted Martin to add a new wing to its North Street factory in 1925. 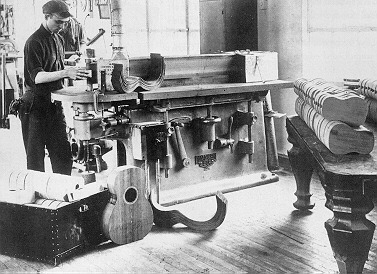 Production peaked in 1926, with Martin making over 14,000 ukuleles that year alone, allowing the funding of a second story to the new wing of the factory in 1927. Uke sales then tapered off in 1928, before slowing to a trickle as the Depression deepened in the early 1930s. In addition to Ukes, Martin decided to try their hand at making steel-string Hawaiian guitars. (The Gibson Company in Kalamazoo, Michigan, began making steel-string guitars around 1900, but they envisioned their guitars with arched, rather than flat, tops, and as the bass instruments in mandolin quartets rather than as a solo instrument. Also around the turn of that century, the Larson Brothers in Chicago began making steel-string guitars, but their production was far less than Martin's, and their reputation had yet to establish itself with professional players). They tested the waters late in 1916 by making Koa topped guitars for the the Southern California Music Company of Los Angeles. The guitars were a smashing success, and Martin made a total of 261 such guitars over the next year and a half. As we can see in the example pictured below, these guitars, although made by Martin, were labeled as being associated with Manuel Nunes, the famous Hawaiian Uke maker. A 1916 Koa topped guitar made by Martin for the Southern California Music Company. The internal label of the above guitar, stating its maker as M. Nunes. 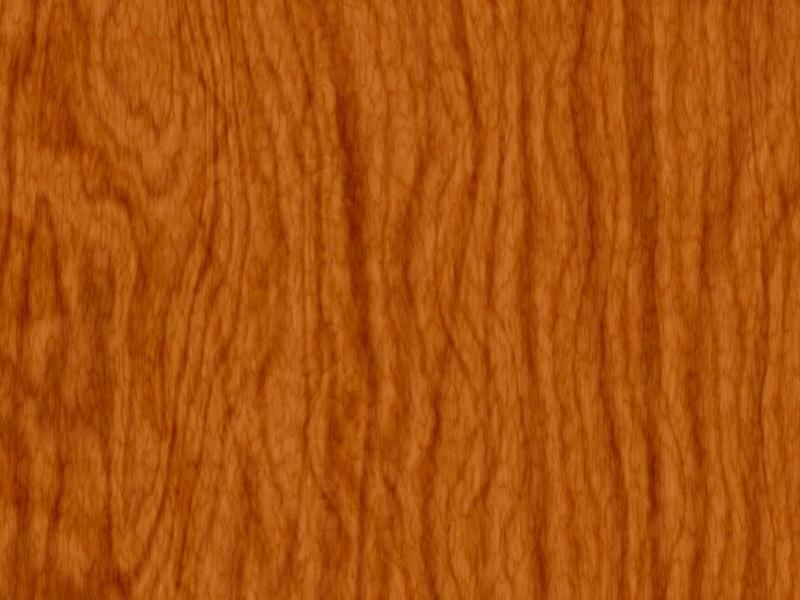 Mike Longworth notes that Martin has specs on file in their archives indicating that a Hawaiian Koa wood dreadnought size guitar was planned as an addition to the Ditson line from 1917-1923. The guitars were to be labeled Kealakai, but the model apparently never got off the ground. John Deichman (Martin factory foreman) prototype dreadnought, 1916-1917. Professionally restored, this is an extremely important historic instrument. Deichman stated this was the first prototype dreadnought. It has Mahogany top, back, & sides. Most importantly, the guitar has a Hawaiian set up. A photograph of a C.F. Martin & Co. luthier at work in 1925. Note the dozens of ukulele bodies on the table. A koa topped guitar body is on the floor. 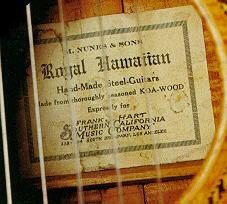 In 1925 Martin made 254 Koa topped guitars, and 10,870 ukuleles. A 1926 Martin Model 0-28K Koa topped Hawaiian slide guitar. 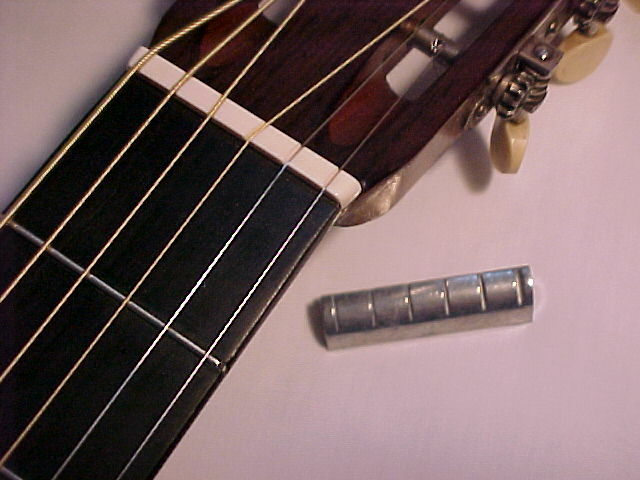 The first Martin Koa guitars were sold with an optional nut adjuster, thus making an otherwise Spanish style guitar convertible into a guitar for Hawaiian slide playing, flat on the lap. As the 1920's approached Martin's Koas were available with either a standard "Spanish" setup or an Hawaiian setup. The Hawaiian setup consisted of a flat fingerboard, raised nut, flat frets (flush with the fretboard), and straight (rather than compensated) saddle. 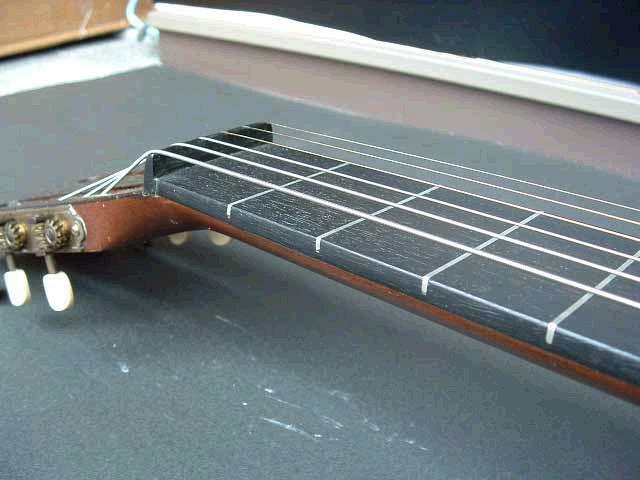 The permanently raised nut and flush frets on a Martin 0-18K with Hawaiian setup. 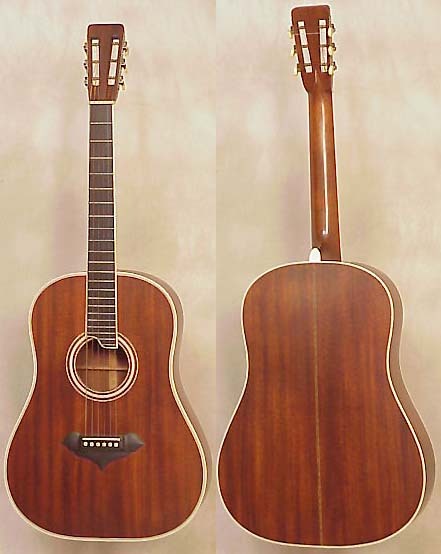 Martin offered its standard, non-Koa, models with Hawaiian setup. In fact, Martin made a total of 524 Hawaiian steel guitars with Spruce tops, and 952 with Mahogany tops. Martin releases a catalogue exclusively advertising their Ukes. Martin introduces its first steel-string "Spanish" (non-slide) style guitar, the all-Mahogany model 2-17.